One of the most reliabe of all of the cultivars Mandevilla x amabilis ‘Alice du pont’ with its attractive pink flowers has many desirable characteristics. This is not a climber that turns rampant, so maintenance is fairly easy. 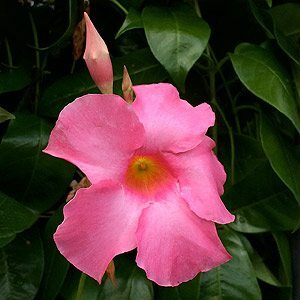 This is an evergreen twining climber, flowers will last around a week and Mandevilla Alice dupont will repeat flower. All Mandevillas are originally from South America and do like a warm climate, or at least a warm position. They do not like cold wet winters. They also grow well in Victoria and South Australia as long as they are in a warm sunny position, well drained in winter. However they can decide to die back in cold winters, to bounce back in spring. Mandevilla ‘Alice du pont’ looks great growing on a fence, a trellis or allowed to climb over a shed. Yes you can grow ‘Alice dupont’ in a container,so it could be grown in a courtyard or on a balcony, it will need a trellis of some sort. can reach 5m high, but easily pruned. Very little care other than pruning in spring to remove any growth damaged in the winter or to maintain a more shrubby / bushy habit. Fertilize with a slow release type fertilizer in spring, mulch well to maintain a cool root run and water with some liquid seaweed fertilizer every month for great flowers.